Sophomore year broke Clementine Williams’ heart. She fell for her best friend’s boyfriend and long story short: he’s excused, but Clem is vilified and she heads into summer with zero social life. Enter her parents’ plan to spend the summer on their sailboat. Normally the idea of being stuck on a tiny boat with her parents and little sister would make Clem break out in hives, but floating away sounds pretty good right now. Then she meets James at one of their first stops along the river. He and his dad are sailing for the summer and he’s just the distraction Clem needs. Can he break down Clem’s walls and heal her broken heart? 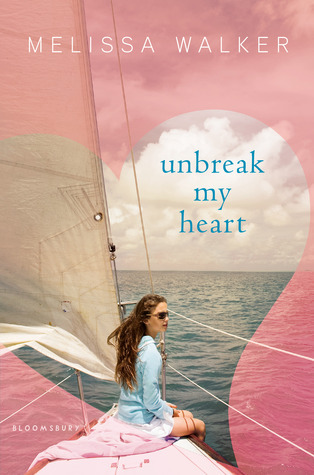 Unbreak My Heart is another perfect summer read to add to my list, and not just because it’s set in the same season. I fell in love with the characters, their stories and the setting of this book – and when I say in love, I mean head over heels. Though it was by no means an easy book for me to read (more on that later), Melissa C. Walker did an incredible job writing a story that would reel me in, churn me up and set me back down whole, unbroken and thoroughly changed. I love Clementine. She’s so easy for me to relate to! Because the book is told from her perspective, we get a good long look at her thoughts, her feelings and the things she loves. It was remarkable writing, to me, because I was completely drawn into her character’s emotions and experiences. I felt for her when she was going through that crazy difficult experience, when her sadness threatened to overwhelm her, when the promise of happiness suddenly made itself obvious. I love that there’s a fun cast of characters that were alongside Clementine for her summer adventure – and that each character has their unique identifier. Melissa manages to create awesome personalities in Clem’s mom and dad, her sister Olive, mysterious boy James and his father and even the old couple Ruth and George. Clem’s parents, by the way, are YA stars, as far as I’m concerned. They care about their family, they care for Clem and they’re just plain cool. I mean, hello, the fact that they’d take their kids out for a whole summer sailing – that’s awesome! And I love how they were always there for Clem, whether she wanted them to be or not, and how they didn’t push her until she was ready to talk to them. Olive is a scene-stealer, and I loved her bits in the book! She’s certainly a catalyst in some situations, but for the most part, I loved her because she reminded me of my own little (well, not so little) siblings. She has the same intelligence as them, the same yearning to be a part of what I was a part of, and even the dogged affection and surprising level of perception. I wanted to hug Olive right after reading this book! And James – well, James is certainly a boy that I could fall for. He’s intelligent and sweet and funny and silly and good with people and he draws. Every single time he appeared in the book, I was excited to see him. He certainly helped Clem out of her funk, and I do love that he wasn’t just a random character and that he had his own past to hide. James sets a high standard for the boys in real life with the way he feels for Clem and the things he does for her in this book. Their romance is gradual, and I definitely love that. It would have been strange if Clem had gone for him straight away, so it was good that it took a while for them to get to being more than friends. I haven’t mentioned the setting yet, and I assure you that I have just been waiting for the right moment to squeal about this setting! I love the idea of spending an entire summer sailing on a set course – just you, your loved ones and the boat. Though it would mean being constricted and limited access to everything online, I just think it would be the most incredible experience ever. After reading, I wanted to head to the nearby marina and just hop on a boat already! Melissa manages to make boating life come across as interesting, yet relaxed, with details here and there that make the whole thing seem more authentic to me. I finished this book in one day – it was that gripping. I remember starting this book on the subway and nearly missing my stop because I was so into what I was reading. It was filled primarily with calm, quiet moments packed with an emotional punch, and I just found myself caught up in it, with matching tears and laughter ensuing. One specific thing that I loved in this book was the mention of the song game. I remember coming across that moment and going, “Oh my God, I totally do that too!” I play the song game often in real life (and I’m sure most of you have too) and it just made me smile to see it mentioned in the book. Apart from that, I love the way Melissa writes. There were so many lines that I just had to stop and savor while I was reading – and I’m sure that these are going to become quotable quotes for many other people. It’s beautiful overall in choice of words and turns of phrase, and that made me love this book all the more. I know that this is a book that talks about cheating. And while I’m definitely not a person who condones cheating in any form, I love that Melissa allowed me to understand how things could have spiraled out of control like that between Clem and the guy in question. It doesn’t justify anything, by any means, but it definitely helped me get a different perspective on it. Obviously, this book is fantastic. It takes the difficult issue of cheating and its repercussions and weaves it into this story that is emotional, believable and compelling. I fell in love with Clem and her story, with James and his story, with Clem’s family, with the boating life – I fell in love with this incredible novel. Add Unbreak My Heart to your summer reading list friends – I promise you won’t regret it. This post is part of Travel Tales, co-hosted with Novel Sounds and Rather Be Reading. This sounds...amazing. I am glad you enjoyed it so much; I hadn't really read any reviews on it, but you gush so much, that I definitely want to pick it up. I am against cheating also, so I am looking forward to seeing this different perspective you talk about. I really, really enjoyed this book. It's definitely one of those surprises that take your breathe away as you're reading. I wasn't expecting that sort of depth with this one. I have a hard time with cheating books because I get so angry at the characters, but this book brought a whole new perspective to the subject matter. I really respect Melissa for writing such a story. I loved this book too! It made me want to hop on a sailboat immediately and just float away for a summer. I especially liked how the author went back in time to explain the events that led up to Clem being in the situation she was in. Great review! I need to give this one a reread eventually! OH THIS BOOK. It broke me. I had a Clem moment when I was younger and THIS. Except I wasn't on a boat. So of course, I fell in love with this story (of course, it is an excellent story, but it resonated with me) and I immediately went and read Small Town Sinners after I finished it. The characters were believable and fantastic, great setting, the songs, just everything. This is one of my favorite contemps of the year, for sure, and it just may be one of my top for the year too. LOVED IT. Great review. So glad you loved it. So glad to see that everyone is loving it. This is one that I've totally been wanting to read (but for some reason wasn't on my "to-list", so thanks for reminding me. I love that there have been several books recently with parents and siblings present and awesome in the book. Makes me happy. Also, SAILING! I love boats and the ocean, so this setting is perfect. I was a bit hesitant to start it because of the cheating thing, but like you, I completely fell in love with the story and the characters! We have to available write my paper services online for students and quality writing services for special students. We help online.